Light energy drives photosynthesis, but it simultaneously inactivates photosynthetic mechanisms. A major target site of photo-damage is photosystem II (PSII). It further targets one reaction center protein, D1, which is maintained efficiently by the PSII repair cycle. Two proteases, FtsH and Deg, are known to contribute to this process, respectively, by efficient degradation of photo-damaged D1 protein processively and endoproteolytically. This study tested whether the D1 cleavage accomplished by these proteases is affected by different monochromic lights such as blue and red light-emitting-diode light sources, remaining mindful that the use of these lights distinguishes the current models for photoinhibition: the excess-energy model and the two-step model. It is noteworthy that in the two-step model, primary damage results from the absorption of light energy in the Mn-cluster, which can be enhanced by a blue rather than a red light source. Results showed that blue and red lights affect D1 degradation differently. One prominent finding was that D1 fragmentation that is specifically generated by luminal Deg proteases was enhanced by blue light but not by red light in the mutant lacking FtsH2. Although circumstantial, this evidence supports a two-step model of PSII photo-damage. We infer that enhanced D1 fragmentation by luminal Deg proteases is a response to primary damage at the Mn-cluster. Light, the source of energy that drives photosynthesis, simultaneously engenders photo-damage in the photosynthetic apparatuses of thylakoid membranes (Barber and Andersson 1992). The primary target of the light-induced damage is photosystem II (PSII), in which electrons for a series of redox reactions are generated by water oxidation. Photo-damage in PSII complex is targeted further to the reaction center protein D1. Accumulation of photo-damage in D1 results in lower photosynthetic activity. This state is photoinhibition (Aro et al. 1993; Edelman and Mattoo 2008; Nixon et al. 2010). To maintain photosynthetic activity, the maintenance of functional PSII by specific quality control of photo-damaged D1 must be done. Photoinhibition is defined as the state in which photo-damage exceeds the capacity for PSII repair (Aro et al. 1993; Murata et al. 2007; Nixon et al. 2010). Photoinhibition in PSII is often observed in high-light conditions. Therefore, a mechanism by which excess energy engenders destruction of D1 protein has been advocated (Adir et al. 2003; Aro et al. 1993; Barber and Andersson 1992; Vass et al. 1992). In this mechanism (excess-energy model), excess energy that is absorbed by chlorophyll causes destruction of D1 at the electron donor and acceptor sides of PSII. However, previous reports show that D1 damage occurs in a light-intensity-dependent manner, even under low light intensity (Tyystjarvi and Aro 1996). The excess-energy model cannot better explain these results. However, recent reports suggest that another mechanism that results from disruption of the Mn-cluster in oxygen-evolving complex (OEC) triggers PSII damage (Hakala et al. 2005; Ohnishi et al. 2005). In this mechanism (two-step model), the disruption of Mn-cluster by light-absorption of Mn is regarded as a primary step. At the subsequent step, derangement of energy that is absorbed by chlorophyll causes damage to D1 at the electron donor side, similar to donor-side damage of the excess-energy model. Presumably, primary destruction of the Mn-cluster occurs light-dependently. Therefore, a two-step model can explain the D1 damage and its degradation under low light intensity. Another difference between the excess-energy model and two-step model is the action spectra of photo-damage resulting in PSII photoinhibition. The effective light to account for the excess-energy model is the absorption spectrum of chlorophylls (distinct absorption peaks in blue and red wavelengths) (Aro et al. 1993; Barber and Andersson 1992). In contrast, the absorption spectrum of manganese compounds, which have higher absorbance in shorter wavelengths, is effective to account for the two-step model (Hakala et al. 2005; Ohnishi et al. 2005). The exact mechanisms of photo-damage causing D1 destruction are still controversial, but a recent result by Oguchi et al. using photo-damage treatments by different color light-emitting-diode (LED) light sources shows that both excess-energy and two-step mechanisms occur in chloroplasts (Oguchi et al. 2009). In the PSII repair cycle, photo-damaged D1 is rapidly degraded and simultaneously replaced with a newly synthesized one to maintain the productivity of photosynthesis (Kato and Sakamoto 2009; Nixon et al. 2010). We have studied two proteases extensively, FtsH and Deg, which contribute to the degradation of photo-damaged D1 in the PSII repair. A membrane-bound ATP-dependent metalloprotease FtsH is the major protease: FtsH forms hetero-oligomeric complexes consisting of FtsH subunits of two types (type A and type B), which are present in the thylakoid membrane with the catalytic activity exposed to the stromal side, and which degrade its substrate proteins from its terminal end ‘processively’ (Lindahl et al. 1996; Sakamoto et al. 2003; Yu et al. 2004). The presence of both type A (FtsH1 or FtsH5) and type B (FtsH2 or FtsH8) is necessary for active complex formation (Zaltsman et al. 2005). Consequently, Arabidopsis mutants lacking either FtsH subunit show a leaf-variegated phenotype and impair proper D1 degradation (Bailey et al. 2002; Chen et al. 2000; Kato et al. 2009; Sakamoto et al. 2002; Takechi et al. 2000). Given that similar results were obtained for FtsH knockdown tobacco plants (Kato et al. 2012a), we consider FtsH to be crucial for PSII repair through its protease activity to degrade D1 in chloroplasts. In contrast to FtsH, Deg is an ATP-independent serine-type protease, and Deg proteases localized on both stromal and luminal sides of thylakoid membranes are present in chloroplasts (Haussuhl et al. 2001; Kapri-Pardes et al. 2007; Sun et al. 2007, 2010). Studies with mutants lacking luminal Deg proteases suggest that Deg proteases contribute to endopeptidic cleavage of D1 under photoinhibitory conditions (Kapri-Pardes et al. 2007; Sun et al. 2007). The difference in the proteolytic property of FtsH (processive) and Deg (endopeptidic) implies a supplementary role of Deg proteases to increase the recognition site for FtsH in D1 degradation. Our recent study using mutants lacking Deg and/or FtsH has provided evidence that cooperative D1 degradation by Deg and FtsH occurs under photoinhibitory conditions (Kato et al. 2012b). One question arises as to whether such protease activities are correlated with the two-step model: for example, disruption of Mn-cluster might induce dissociation of OEC proteins from PSII complex, which in turn enhances the accessibility of luminal Deg proteases. In this study, we addressed this question using different colors of LED illumination in our D1 degradation assay. Arabidopsis (Arabidopsis thaliana) ecotype Columbia (Col) was used as the wild-type in this study. The mutant lines used for this study, var2-1 (contains a nonsense point mutation) and var2-1 fug1-3, were described previously (Miura et al. 2007). Plants were germinated and grown to 2 weeks old on 0.7 % (w/v) agar plates containing Murashige and Skoog medium supplemented with Gamborg’s vitamins (Sigma-Aldrich Corp.), 2 mM MES, pH 5.8, and 1.5 % (w/v) sucrose under 12 h of light (60 µmol photons m−2 s−1 of white LED light) at a constant temperature of 22 °C. Then, plants were transferred onto soil and maintained under 12 h of light (120 µmol photons m−2 s−1 of white LED light) at a constant temperature of 22 °C. Leaf disks, which were collected from mature leaves of 6-week-old plants using a 5-mm diameter biopsy punch (Kai Corp., Japan), were used for these experiments. After incubation for 0, 60, 120, and 240 min under various light irradiation conditions, the relative chlorophyll fluorescence yield of leaves was measured using a fluorescence imaging system (FluorCam 800MF; PSI Photon System Instruments, Brno, Czech Republic). Before the measurements, leaf disks were maintained in the dark for 10 min to oxidize the plastoquinone-pool; then, the maximum quantum yield of PSII (F v/F m) was monitored. To cause photo-damage to photosynthetic apparatuses, leaf disks were incubated at room temperature on wet filter paper for 0, 1, 2, and 4 h under light irradiation (900 or 1200 µmol photons m−2 s−1 for blue, 1200 µmol photons m−2 s−1 for white, and 1200 or 1500 µmol photons m−2 s−1 for red LED light sources). Blue and red LED lights (Optocode Corp., Japan), respectively, have their peaks at 460 and 640 nm. Full width at half maximum of both LED lights is 20 nm. White LED is a blue LED that contains yellow phosphor. Therefore, it contains a blue peak and a broad green-yellow emission band. The optical spectra were measured using a mini-spectrometer (RC-VIS C11007MA; Hamamatsu Photonics KK, Japan). To isolate thylakoid proteins, leaf disks were frozen immediately in liquid nitrogen and were pulverized using a microtube homogenizer. Samples were suspended in ice-cold extraction buffer (330 mM sorbitol, 50 mM HEPES, pH 7.5, 5 mM MgCl2 and 10 mM NaCl2) and were centrifuged at 15,000×g for 1 min. Then pellets were resuspended in SDS–PAGE sample buffer (125 mM Tris-Cl pH 6.8, 2 % [w/v] SDS, 5 % [v/v] glycerol, 100 mM dithiothreitol, 0.05 % [w/v] bromophenol blue). Immunoblotting was performed as described previously (Kato et al. 2012b). The anti-D1 C-term (dilution 1:5000), as previously described (Kato et al. 2012b), was used for immunoblotting. Signals from immunoblotting were detected (Luminata Forte Western HRP; Millipore Corp.) and were recorded (LAS100-mini system; Fuji Photo Film Co. Ltd., Japan). To improve immunoblot sensitivity, the cleavage products of the D1 protein were redetected after covering the membrane area above 25-kD with aluminum foil. To conduct D1 degradation assay, a non-variegated suppressor mutant, fug1, was used because the leaf variegation in var2 was shown to interfere with the accurate estimation of D1 degradation. Detached leaves from approximately 6-week-old plants Col and var2 fug1 mutant were preincubated with their petioles submerged in 1 mM solutions of lincomycin in the dark overnight. Leaves treated with lincomycin were incubated for 2 h under various light conditions. After immunoblotting, signals of D1 were quantified using the ImageJ program (http://rsbweb.nih.gov/ij/) and were normalized to the amount of CBB-stained LHCII. Blue and red LED light sources used for this study, respectively, have peaks at 460 and 640 nm. White LED light shows a blue peak and a broad green-yellow emission band, as shown in Fig. 1 because a white LED is a blue LED that includes a yellow phosphor. First, we evaluated the extent of photoinhibition in PSII under different light colors by measuring the maximal photochemical efficiency of PSII (F v/F m). Leaf disks prepared from mature leaves of var2 and wild-type plants were exposed to high-light for up to 4 h as described in “Materials and methods” section. Consistent with a previous report (Oguchi et al. 2009), F v/F m values in wild-type during high-light irradiation of blue, red, and white LED at equal light intensity (1200 µmol photon m−2 s−1) showed that leaves under blue light suffered from photoinhibition more than leaves under red and white lights (Fig. 2a). Second, we measured the rate of D1 degradation after high-light treatments to assess whether damaged D1 is degraded normally under irradiation with different light colors. The assay of D1 degradation was performed in the presence of lincomycin, a specific inhibitor of chloroplast protein synthesis. Wild-type showed a rapid decrease of F v/F m values, more in the presence than in the absence of lincomycin (Fig. 2b). The rapid decrease was accelerated slightly under blue light compared to that occurring under white or red light. After 2 h of incubation, D1 degradation rates in wild-type were estimated based on the remaining amount of immunoreacted D1 that was normalized by Coomassie brilliant blue (CBB)-stained LHCII as an internal control (Fig. 3a). D1 levels under blue light decreased rapidly to approx. 25 % of the initial value. However, D1 levels under white and red light increased to approx. 40 % of the initial value (i.e., D1 degradation rates decreased under white and red light source, compared to blue light). These results demonstrated that damaged D1 was degraded normally in any light color that causes photo-damage in wild-type. Next, we measured the extent of photo-damage and D1 degradation in the mutant lacking FtsH2 (yellow variegated2 [var2]). In var2, although F v/F m values decline more under blue light than under other colors, all F v/F m values showed the same trend: F v/F m values in var2 were lower after blue light treatment than those after red light treatment (Fig. 2a, b). As for white light, it remained unclear why the vulnerability of var2 to high-light stress facilitated photoinhibition (Fig. 2a). In our experimental system, the variegated phenotype in var2 was shown to hamper precise quantification of of D1 levels (Kato et al. 2009). Thus, we used a non-variegated suppressor (var2 fug1) to assess the rate of D1 degradation. The var2 fug1 mutant shows the delay of D1 degradation and the accumulation of D1 cleaved fragments as well as var2 (Kato et al. 2009; Kato and Sakamoto 2014), demonstrating that they have a common feature in D1 degradation. Immunoblotting results in var2 fug1 showed, as expected, that the D1 turnover rate was markedly decreased irrespective of light color (Fig. 3c). The D1 levels after white and red light treatment were approx. 70 % of the initial value, and were similar to those presented in our previous report (Kato et al. 2009). The D1 level after blue light treatment decreased marginally (approx. 60 %), but the difference between blue and red/white lights was not significant. As a consequence, although D1 degradation rates in the mutant lacking FtsH2 were lower than those in wild-type under each light irradiation, the photo-damage under blue light consistently accelerated D1 degradation. We attempted to evaluate the effect of different light colors on D1 degradation mediated by Deg proteases. In wild-type, D1 fragments produced by stromal and/or luminal Deg proteases are degraded rapidly by FtsH. However, we found that D1 cleaved fragments can be detected after intense high-light treatment (2500 µmol photons m−2 s−1 of white LED light), when var2 leaves are subjected to this assay (Kato et al. 2012b). We have shown that damaged D1 is cleaved predominantly by Deg proteases at two sites, one between helices C and D of the D1 (CD loop) at the lumen and the other between helices D and E (DE loop) at stromal side. Consequently, this assay enables us to evaluate the participation of Deg protease. After exposure to blue, white, and red LED light sources, D1 cleaved fragments were detected in immunoblotting using specific antibodies that recognize the C-terminus of D1 protein: the 16-kD and 12-kD fragments, respectively, correspond to products from cleavage at the CD loop and at the DE loop of D1 (Kato et al. 2012b). Immunoblot analysis showed that the 16-kD fragment increased markedly after white and blue light treatments in var2, as portrayed in Fig. 4a. The 16-kD fragment appeared to accumulate more after blue light than after white light treatment, although the difference was not significant. By contrast, we consistently found low accumulation of fragments after red light exposure. These results implied that D1 fragmentation was accelerated by short-wavelength light, which is more effective at causing photo-damage of the two-step model. To exclude the possibility that lower levels of D1 fragments resulted from a low photoinhibition-state under red light irradiation, we conducted the same experiments under altered light conditions. Here, we used either low-intensity blue light (900 µmol photon m−2 s−1), high-intensity red light (1500 µmol photon m−2 s−1), or medium-intensity white light (1200 µmol photon m−2 s−1) to perform our D1 fragmentation assay. It is noteworthy that, under these conditions, F v/F m values showed that photo-damage under red light was more accelerated than that under blue light (Fig. 2c, d). Similarly, the assessment of D1 degradation also showed more rapid D1 degradation under red light (Fig. 3b, d). Consequently, D1 degradation rates were indistinguishable among all light treatments. In sharp contrast to these observations, immunoblot analysis for D1 cleaved fragments showed that the level of D1 fragments after red light treatment decreased significantly compared to those after white and blue light treatments (Fig. 4b). In fact, quantification of the 16-kD D1 fragment verified that this fragment showed up significantly in blue and white lights, but not in red light. Collectively, our data showing that D1 fragmentation was not promoted by red light irradiation paradoxically suggested a correlation between photo-damage caused by the two-step model and D1 fragmentation. In this study, we tested whether the D1 degradation process, both in processive and endopeptidic activities that play critical roles in PSII repair, can be affected by qualitatively different photo-damage that occurs according to the two-step model. One prominent observation that we found in the current study is the significant difference of D1 fragmentation: The 16-kD D1 fragment that is generated by luminal Deg seemed to increase under blue light irradiation, but D1 fragmentation decreased markedly under red light irradiation in var2 (Fig. 4). D1 fragments under high-light irradiation of blue and red light at an equal light intensity would be expected to show similar levels if photo-damage attributable to the excess-energy model is mainly involved in D1 fragmentation. However, D1 fragmentation differed markedly between these lights. Although our data were circumstantial, these results suggest that photo-damage of the two-step model was strongly involved in D1 fragmentation. In the two-step model, a primary event is disruption of a Mn-cluster in PSII. A secondary event is damage to D1 caused by energy that is absorbed by chlorophyll (Hakala et al. 2005; Ohnishi et al. 2005). Details of the secondary step remain unclear, but oxidative damage of amino acids near the reaction center chlorophyll (P680) or damage by ROS (e.g., 1O2) is suggested (Nishiyama et al. 2006). Consequently, it is likely that the damage engenders an unstable state between PSII core proteins and OEC proteins. In chloroplasts, several Deg proteases are peripherally associated on the luminal side of thylakoid membranes (Schuhmann and Adamska 2012). According to previous reports using Arabidopsis mutants and knockdown lines, D1 is fragmented by Deg1, Deg5, and Deg8 in the thylakoid lumen at its loop connecting transmembrane helices (Kapri-Pardes et al. 2007; Sun et al. 2007). Because OEC proteins are attached to the luminal side of PSII complex (Ido et al. 2014), D1 fragmentation at the loops is prevented, but the unstable state between PSII core proteins and OEC proteins might allow Deg proteases to access photo-damaged D1 (schematically presented in Fig. 5). In relation to this observation, it is noteworthy that no D1 fragments from cleavage at DE loop (stromal side) were detected in our previous study (Kato et al. 2012b). This fact implied that the cleavage at CD loop (luminal side) by luminal Deg proteases is conducted before the cleavage at DE loop. At least in chloroplasts, the primary damage of photoinhibition around OEC can be compensated by the luminal Deg activity in PSII repair. It is noteworthy that in our initial report, we were unable to detect D1 cleaved fragments by the experimental method using a halogen light source at the intensity of 1200 µmol photons m−2 s−1 (Kato et al. 2009). We reasoned that this result was attributable to insufficient light intensity. Therefore, we used white LEDs instead of a halogen light source to increase light intensity to 2500 µmol photons m−2 s−1: as a result, D1 fragments were detected (Kato et al. 2012b). This study, however, revealed that if white LED is used, lower light intensity at 1200 µmol photons m−2 s−1 is sufficient to detect D1 fragments. A halogen lamp has a smooth continuous spectrum in the wavelength range from visible to far-red, whereas white LED has a blue peak at 460 nm because it is derived from a blue LED (Fig. 1). Therefore, it is likely that a white LED is more effective at inducing D1 fragmentation than halogen light is. Together, these results reinforce our conclusion that D1 fragmentation mediated by luminal Degs is accelerated by blue light. On the other hand, the fact that red LED light and halogen lamp cause photoinhibition without generating a large number of D1 cleaved fragments suggested that several mechanisms contribute to photo-damage process, as reported in previous report (Oguchi et al. 2009). Based on the difference between an excess-energy model and a two-step model, here we speculated on the difference of D1 fragmentation under various light treatments. However, we cannot rule out the possibility that protease activities of Deg were downregulated after red light treatment. Our immunoblot analysis indicated that Deg protein levels are unaffected by different light sources (not shown). Kley et al. proposed that lowered pH in lumen under light conditions engenders Deg1 activation (Kley et al. 2011). In addition, a recent structural study demonstrating that a Deg5 trimer harbors two calcium ions in their central channel implied the relation between their activation and the concentration of calcium ions in the lumen (Sun et al. 2013). The manner in which Deg proteases are activated in vivo under different light conditions must be investigated in future studies. In addition to Arabidopsis, the accumulation of D1 fragments in the mutant lacking FtsH has been observed in Chlamydomonas until now (Malnoe et al. 2014), although it remains unclear in cyanobacteria. 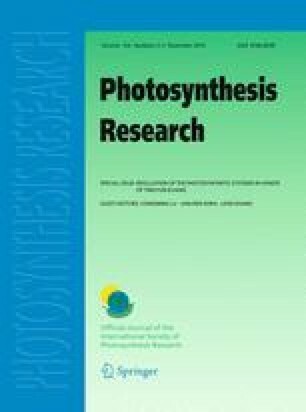 It is an interesting question whether the difference of photo-damage mechanisms affects D1 degradation process in other organisms that use photosynthesis. We would like to thank Rie Hijiya for her technical assistance. This work was partly supported by the Japan Science and Technology Agency (Core Research for Evolutional Science and Technology, to W.S.) and by the Oohara Foundation.